Flowing City is the second call of the Exhibit Around platform and follows the success of Urban & Human Empathy. A collective editorial project composed of words and images in black and white, in which writing and photography intertwine and influence each other. 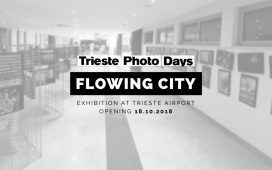 The project includes an international exhibition and a photographic volume of 300 pages with photos and projects of the 69 selected authors, embellished by the stories of Roberto Srelz, which will be officially presented in Trieste Photo Days 2018. Winner photographer: Malgorzata Mikolajczyk (Poland) with the Black Protest project, which documents a women’s protest in Warsaw. Winner photographer: Steve Geer (USA) with One-sixth Of A Second, a street photography project set in Chicago.